The tropical Pacific is the largest source region of CO2 release to the atmosphere through the sea surface, with air–sea CO2 fluxes varying on seasonal to interdecadal timescales, which is attributed to several factors. At present, there is no consensus on the relative contributions of wind speed and ΔpCO2 (the partial pressure of CO2 [pCO2] difference between sea surface and the atmosphere) to the interdecadal variability of CO2 fluxes, especially concerning their linkage with the Interdecadal Pacific Oscillation (IPO). By using a coupled ocean physical–biogeochemical model forced by the NCEP/NCAR winds during 1958–2016, we show that the CO2 fluxes exhibit interdecadal regime shifts in 1975–1976 and 1997–1998, which is coincident with the regime transitions of the IPO. 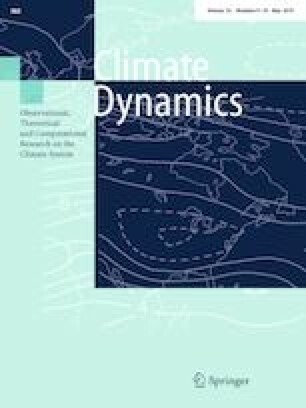 Furthermore, the interdecadal variability of wind speed is demonstrated to play a significant role in determining the magnitude and location of interdecadal variability of CO2 fluxes, while the contribution of ΔpCO2 is relatively small. Additionally, the location of maximum variability of CO2 fluxes gradually migrates westward during 1958–2016, which is related to the interdecadal change in the relationship between wind speed and CO2 fluxes. Modelling results suggest that the regime shifts of CO2 fluxes in the future decades may significantly influence the projection of long-term trend in CO2 fluxes in the tropical Pacific Ocean. The authors wish to thank the anonymous reviewers and editor for their insightful comments that greatly helped to improve the original manuscript. We would like to thank Zeng-Zhen Hu, Jieshun Zhu, Zhaohua Wu for their comments. This research was supported by the National Natural Science Foundation of China (NFSC; Grant nos. 41475101, 41690122(41690120), 41490644(41490640), 41421005), the Strategic Priority Research Program of the Chinese Academy of Sciences (Grant no. XDA19060102), the NSFC-Shandong Joint Fund for Marine Science Research Centers (U1406402), and Taishan Scholarship. The data and computer codes used in the paper are available from the authors (e-mail: rzhang@qdio.ac.cn).